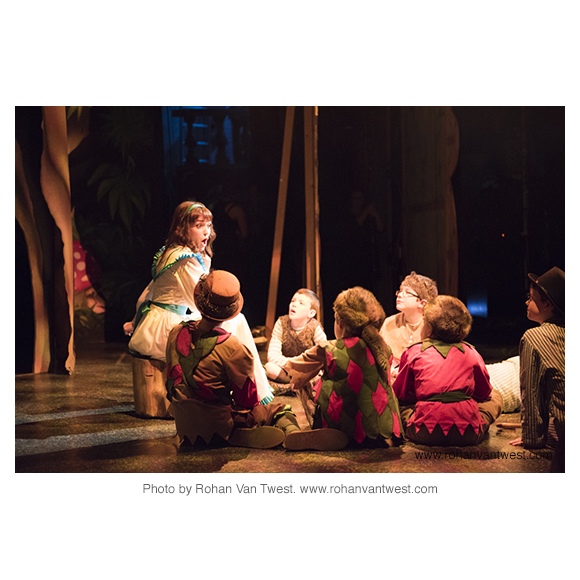 Peter Pan at The Devonshire Park Theatre. Last winter I had the wonderful opportunity to spend some time at Eastbourne Theatres while they put together their seasonal Pantomime show along with Jordan Productions. It was a massive, new, show, with a huge cast that came together in a remarkably short time considering all the various elements that had to be squeezed into the delightful but smallish Devonshire Park Theatre. I've just put a large selection of the images online, hopefully you have already had a chance to take a look, but in case you haven't, here's a link (and a photo). I had hoped to have a physical exhibition of the images. I may well still do - the few I've had printed so far are an absolute delight to look at, but finding the right location for such an exhibition has proved to be a bit tricky. I had the rather ambitious idea they would look good in the foyer of the National Theatre - Or perhaps in the Towner Gallery right next to the Devonshire Park Theatre itself, but both routes seem fraught with complications and difficulties. Smaller, less prestigious spaces are available locally, but I struggle to justify the expense of such an undertaking against the exposure the images would receive. I was contemplating all these issues in the spring when I found myself at an Annie Leibovitz exhibition in San Francisco, that was touring the world - and nearly all the images were being displayed on very large digital screens. (See my blog 03/03/2016) It had more in common with a trip to the cinema than a traditional photographic exhibition, where most people viewing the images stayed still in a large hall, and the images alternated across the screens. It struck me then that going to all the trouble of printing and framing individual prints might be a thing of the past, that this is now the way to display images. Of course, creating wonderful prints, framing them to archival standards behind non reflective glass and hanging them in a great location can still create a dramatic and wonderful effect, but the last print I had prepared in this way cost me close to £400 to produce. I had a short list of around 1000 images from my Pantomime project and creating the high quality exhibition that I was hoping for was beginning to look out of reach. So, I came to the conclusion the pantomime project might have to be displayed digitally if I wanted it to see the light of day. The resulting images went online yesterday, on the day this year's pantomime opened at the same theatre (Snow White - I'm looking forward to seeing it myself) I sent out a few links and tweets to various people involved in the project and after about 24 hours something like 200 people have been onto the website to look at the images, staying for an average of just under three minutes each to look at the 300 or so images. If I had opened the show in a small gallery and had the same number of people in over the same time period, I'd have been delighted, and of course, the images will be available to view for a long time to come yet. My only slight disappointment is that the rather lovely physical quality and detail of the printed images will not be seen and appreciated by anyone, but maybe there will be a "proper" exhibition at some point in the future. If you have any ideas or suggestions as to how this might come about, please do get in touch and pass them on.